When people think of Japanese overseas settlements it is usually Hawaii or California or possibly even Brazil that come to mind. Few are likely to wave the Spanish flag and recite the name Coria del Rio though in fact this was the first Japanese settlement in Europe and many of the town today still carry the surname "Japon". And it was all down to a gentleman by the name of Hasekura Tsunenaga. In 1613, under the decade old new Shogunate, a delegation was despatched to Europe to both sign a trading treaty with Spain and to open communications with the Vatican. Travelling via New Spain (Mexico and modern day California) the party left Japan on a ship built by the Englishman Will Adams, later to be made famous by James Clavell in his book Shogun. Timing and politics conspired against the embassy however and although they met both Pope and the King of Spain, by this time Japan had started to close to foreigners and especially Christians. Knowing the fate that awaited them on return, many who had converted to Christianity chose to stop off in Coria del Rio and make a new life. However, those returning to Japan struggled to hold on to theirs. Curiously the entire adventure passed from memory in Japan and remained unknown until the late 19th century when reports of the venture arrived via European texts. 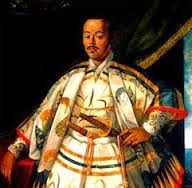 And so, although the Mongol hoards reached the borders of modern day Europe, the blue birthmark in southern Spain is purely the work of Hasekura Tsunenaga and his band of merry Samurai some four hundred years ago.